Non Resident Indians (NRIs) and Foreign Nationals of Indian Origin (FNOIs) shall not be entitled for the Service Tax Exemptions on Insurance policy premium here after – thanks to the introduction of GST in India. NRIs and FNOIs were enjoying service tax exemptions on the premium of insurance policies till June 30th of 2017. Policy holders of LIC of India and other private companies who recieved this benefit under the era of Service Tax will have to pay higher premium with the introduction of GST in India. For your further information, let us have a look at the changes in service tax rates for insurance policies before and after the introduction of GST. GST on Life Insurance Premiums – Change in Service Tax Rates. LIC of India started collecting service tax on the insurance premium for new policies from 01.01.2014 along with the historic re introduction of its schemes. But later, Life Insurance Corporation of India allowed service tax exemptions on the policies taken by NRIs and FNOIs with effect from 3/12/2015. The policy holder was to submit residence proof and other supporting evidences to prove that he had an NRI status, in order to avail the exemption. 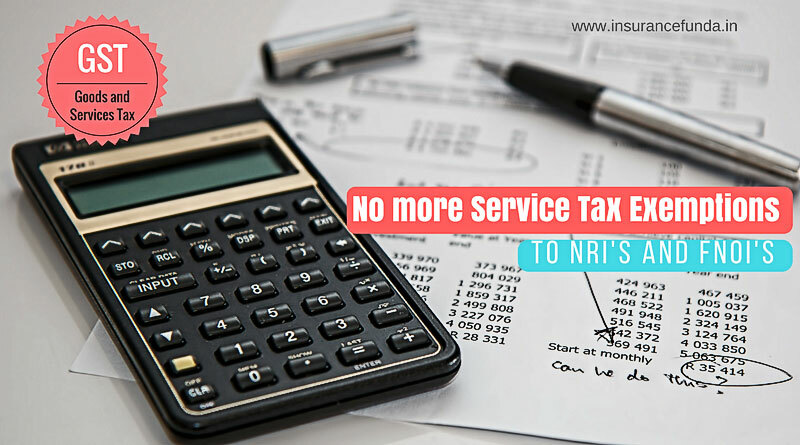 It was logical to exempt NRIs and FNOIs from paying service tax as they are not availing any service in India during that period. Many think that the newly introduced GST, as it is actually replacing the service tax existed, should follow the precedence on giving service tax exemptions. For the time being, NRIs and FNOIs have to wait for further government orders to reinstate the exemptions. No need to add that the withdrawal of exemptions literally came as a bolt from the blue for NRIs and FNOIs.